Some people say they don’t like duck because “it’s too greasy” or “it’s tough.” The problem is that the duck they’ve eaten just wasn’t cooked right. Ducks, like other domesticated fowl, including chickens and turkeys, have both dark meat (legs & thighs) that require long, slow cooking and light meat (breasts) that is best when cooked for a much shorter time. The solution? Cut the duck up and cook the various parts in the manner that yields the best results. Braising is generally the best method for cooking the leg quarters. A quick sear in a hot pan, followed by the addition of liquid, whether water, wine or stock, and extended cooking time at low heat with the lid on will yield rich, tender and mouthwatering results. One well-known example of this method is the classic preparation, duck confit, where dry-marinated duck legs & thighs are slowly simmered in pure, shimmering duck fat until they reach a falling-off-the-bone, velvety texture. 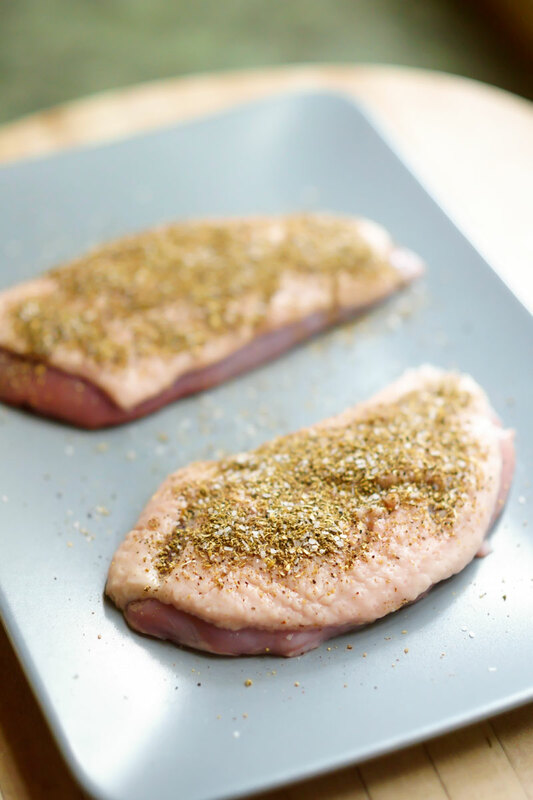 Duck breasts are even easier to prepare. This fast, simple method for cooking juicy, tender duck breasts will make you think you’re eating filet mignon or venison – but with a flavor that’s all duck. It helps if you think of the duck breast as a piece of prime, lean steak and cook it accordingly. Use a little caution when cooking, just as you would with steak – duck breast is at its very best when cooked to barely medium rare with plenty of pink in the middle. Our recipe cooks in just minutes in a heavy-bottomed skillet, but it’s just as easily done and just as fast on the grill. It starts with two meaty duck breasts, trimmed of excess skin and fat, so just enough remains to cover the breast. The skin is scored to allow any remaining fat to quickly render and drain away. 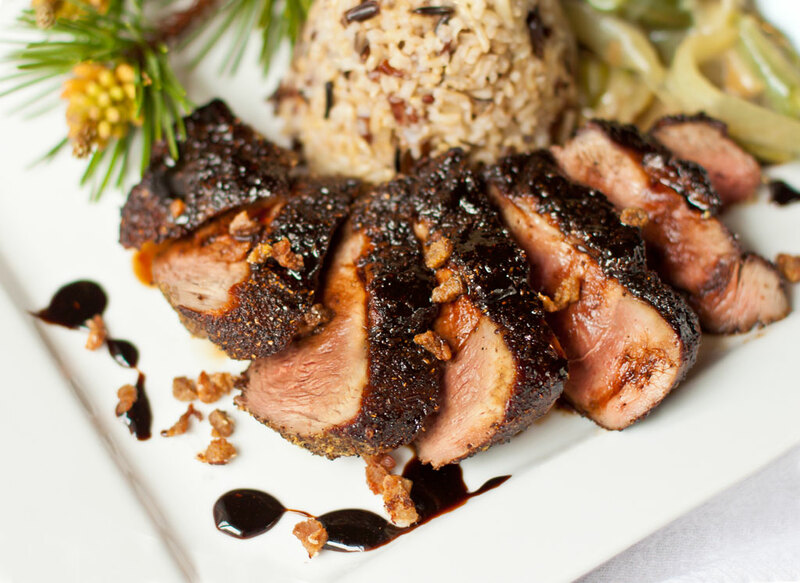 A flavorful blend of sweet spices, including piney juniper berries, is rubbed into the duck which is then left to marinate for several hours, allowing it to infuse and permeate the meat completely. If you’re cooking for a crowd, just multiply the recipe by the number of guests. With an entrée this easy to prepare, you’ll have plenty of time to mingle and enjoy the party too. Trim away the excess skin & fat & cut it into 1/4 inch pieces. Put the bits of fat and skin into a small skillet over medium heat. Cook until the fat has rendered and the bits are very crisp and golden brown, stirring occasionally to prevent sticking. Pour off the rendered fat and reserve for other uses. Drain the crisp “cracklings” on paper towels and set aside. With a very sharp knife, cut diagonal slits in the skin of the duck breast, taking care not to cut into the flesh. Sprinkle both sides of each duck breast generously with the spice rub, making sure that all parts are thoroughly coated. Set aside for at least 2 hours or up to overnight. Heat a large heavy skillet over medium-high heat. When the pan is nice and hot, but not smoking, place the duck breasts into the pan, skin side down, and sear for 5 -6 minutes, reducing the heat to medium-low after 3 minutes. Turn the duck breasts and cook for 3 – 4 minutes longer. The duck breasts will be cooked to medium-rare at this point. Do not overcook them. Remove them to a warm plate, cover loosely and allow to rest while you prepare the sauce. Maintain the heat at medium-low. Add the Sherry Vinegar Glaze and Pine Bud Syrup to the pan to deglaze, scraping up any brown bits with a spatula or spoon. Simmer for a minute or two. Turn off the heat. 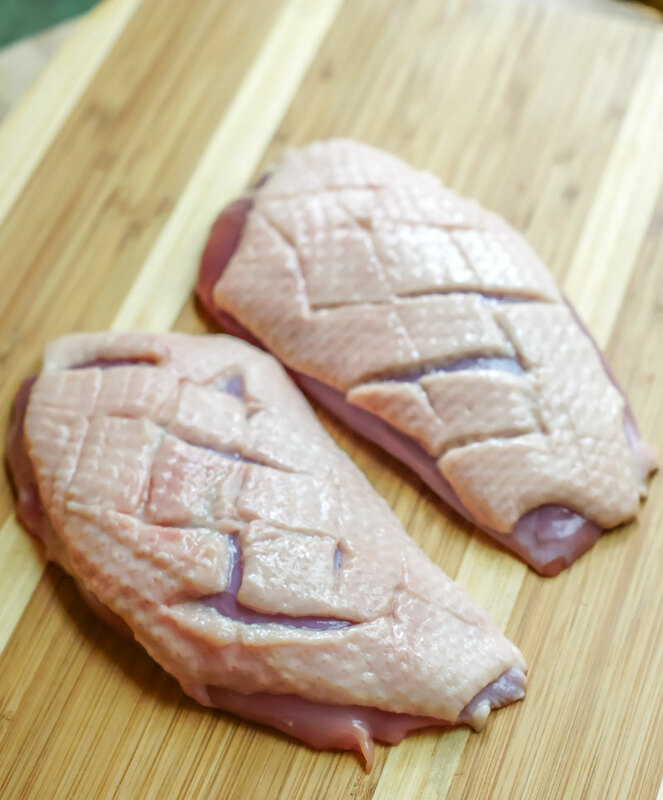 Slice the duck breasts diagonally across the grain into half-inch thick slices and arrange each breast on a plate. Drizzle generously with the sauce and top with a sprinkle of the crisp duck skin “cracklings.” Serve immediately. Remove the large seeds from the juniper berries. Toast the juniper berries, black pepper, allspice and coriander in a small pan until fragrant. Remove from heat and set aside until cool. Grind the toasted ingredients finely in a spice grinder & mix with remaining ingredients.